Our Three-Step Interactive Program will give you the study aids needed to pass the Pearson VUE and PSI mandated exam and help you overcome any fears or anxiety you may have about taking your Real Estate Licensing Exam. As a Premium member you can take an endless number of computer generated prep exams as many times as you like and prepare just like you are taking the actual Pearson VUE and PSI Real Estate Test. We have created over 9000 possible test questions which cover every concept that you will need to know to pass the test and get your license. You will also have access to many exclusive features such as professionally written study guides, study & test taking strategy guides, "ask the professor" for live help with problem areas or confusing topics, and a guide to choosing a broker. This is a Proven System that is guaranteed to prepare you to pass your licensing exam! First: Purchase your correct package. We offer our premium package which includes both National and State Real Estate Prep Study Guides and both National and State test questions. 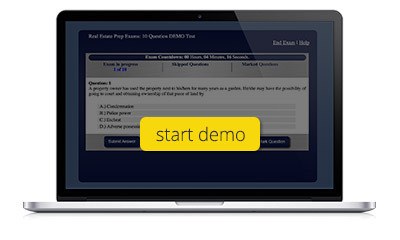 Real Estate Prep Exams currently offers the premium package in the following states: Arizona, California, Connecticut, Florida, Georgia, Massachusetts, New Jersey, New York, Texas, Virginia and Washington. All other states we offer the National portion only. Second: Take advantage of our professionally written Study Guides. These guides are for all National exams and with the Premium Membership include the correct state study material. Third: Take an Unlimited number of Prep Exams, both National and State with the premium membership. You will receive fresh new questions for each test you take. After completion you will receive your results with number correct and incorrect with complete explanations of all questions. Fourth: Study your Results. Continue to study using the study guides provided. Reviewing each exam, paying close attention to the questions you missed or found difficult. Continue taking exams and once you are consistently scoring 85% or higher on your prep exams, you are ready to take the PSI exam! Take an Unlimited number of Prep Exams, with fresh new questions for each exam you take. Study your Results. Once you've consistently scored above 85% on your prep exams, you are ready to take the PSI exam! Experience our live exam demo!